We often speak, and rightly so, of the gospel as the “good news,” the good news of Jesus Christ. God in Jesus has entered the world in a new way bringing new life, offering new hope, and inviting us to become a new person. That it is good news, however, does not necessarily mean it is welcome or easy-to-accept news. I think about the young man who came to Jesus seeking eternal life. “Sell your possessions and give the money to the poor,” Jesus tells him. He went away grieving because he had many possessions. (Matthew 19:16-22) I think about the disciples “who turned back and no longer went about with [Jesus]” saying, “This teaching is difficult; who can accept it?” (John 6:60-66) I think about the religious leaders and authorities who planned to arrest and kill Jesus. (Matthew 26:3-4) I think about Peter’s trifecta of denials. (Matthew 26:69-75) I think about my own struggles to believe, embody, and live the good news. Sometimes I would much rather fit the gospel into my life than fit my life into the gospel. Too often I would rather interpret Jesus’ life than have him interpret my life. I am more comfortable trying to understand the gospel than surrendering and giving myself to the gospel. The gospel challenges me. It challenges the way I see myself, you, and the world. It challenges what I believe and the way I live. It challenges my private concerns, interests, and desires, with those of Jesus. Maybe you know what I’m talking about. I don’t think I am the only one it challenges. The gospel challenges people in every age and every place. It always has. It did in Jesus’ day and it still does today. It challenges us to think, see, do, and be differently. It challenges us to change. In some sense to really hear and understand the gospel ought to make us uncomfortable. I’ve come to believe that that discomfort is God’s grace leading and guiding us to a new way, a new life, a new world. It is the seed of God’s life planted in each one of us. And that is good news. Let’s not turn away from the challenge, the discomfort, or the good news of today’s gospel. So how might the parable of the sower (Matthew 13:1-23, Proper 10A) interpret our day, our time, our world circumstances? Where does it make us uncomfortable? What is so challenging about a sower who went out to sow? We could answer those questions in a thousand different ways but here’s one way. What if a sower went out to sow and over the last nine months planted more than 52,000 seeds in our land? What if God is sowing himself in our land through the lives of the immigrant children? What kind of soil are we offering them? Some might say I am stretching this situation to fit the gospel. I don’t think so. This wouldn’t be the first time God has revealed himself through the life of a poor child. This wouldn’t be the first time God as a child refugee has fled the violence of his hometown. The seed of God’s life and presence comes to us in lots of different ways. Sometimes we ask for it. Other times we don’t. Sometimes we recognize it. Other times we don’t. Sometimes we’re receptive and open to it. Other times not so much. Regardless, the seed has been sown. That’s a given. It’s a given in today’s parable and in today’s world. The variable is the soil. The variable is us. There is a range of receptivity to the sowing of God’s seed that Jesus describes as four conditions of soil. Isn’t that what this parable is teaching us? And don’t our many responses to the immigrant children only validate the truth of that teaching? Watch the news and you will see volunteers with open arms saying, “Bienvenidos,” protesters with signs saying, “Return to sender,” and everything in between. Some children landed on a path. They thought it would take them somewhere. They hoped it would take them to family, a new home, and a new life. The path was a dead end. They found no home. They received no welcome. They were carried off. Other children encountered rocky ground. But it was ok. They were accustomed to living between a rock and a hard place. Besides there were some soft spots between the rocks. At first they sprang up. People wanted to help and do the right thing but then they got tired, frustrated, and overwhelmed. It was too much, too hard, too demanding. The children couldn’t put down roots. They couldn’t endure. They fell away. Other children fell among thorns. They were tripped by political agendas and posturing on both sides. They were cut by thorns of fear, anger, prejudice, indifference, and self-righteousness. They were choked by the thorns of other’s concerns for themselves, their land, and their possessions. Other children were received and enveloped by the soil of love, compassion, and acceptance. They were nourished with and by a life they couldn’t give themselves. They grew and their lives bore fruit. So what do we do with all these children? I don’t know. 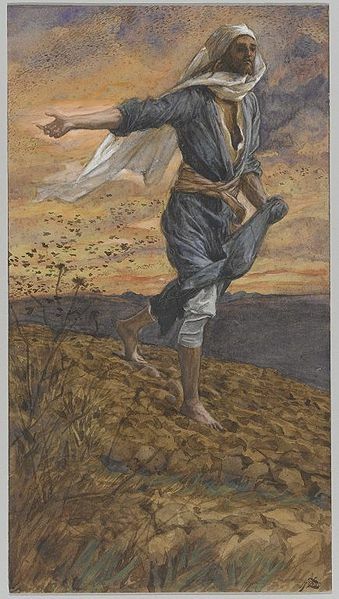 The parable of the sower does not give us the answer. I do not have and I am not offering a particular answer. I have only the challenge of the gospel. The parable of the sower challenges us to stand inside the gospel. That means if we are to hear this parable at the level which Jesus spoke it we cannot just watch the news and make a judgment about others; the children, the volunteers, the protesters, or anyone else. The four soils Jesus describes are inner landscapes, conditions of the human heart. We must, therefore, examine our own hearts. We must reflect on our own soil’s condition. We must consider what soil we offer the seeds God has planted in our lives, regardless of who they are, where they came from, or how they got there. This isn’t about only the children. It’s about all people, all relationships, all circumstances. What soil are we offering them to stand on? What is the soil of our heart? All those kids? They call it a border crisis. I don’t believe that. It’s not so much a border crisis as it is a crisis of the human heart. Some of the children will probably stay some will be sent back. Immigrants will come and immigrants will go. I don’t know when or how the situation with all these children will be resolved but I know this. Until we open ourselves to the planting of God’s life in our hearts, until we are receptive to God surprising us, until we are willing to be inconvenienced by the sowing of God’s seed in our world, until we take seriously the challenge of Christ’s gospel and feel the discomfort of his good news the crisis of the human heart will remain. Our local and county officials are ” dismayed and outraged” that several, we don’t know how many, migrant children were temporarily, we don’t know for how long, housed in some of our private camps last May. Nothing untoward happened, the kids were here and gone before anyone knew about it.The ” outraged” officials are upset because no one told them about it until the children were on their way to a holding facility in San Antonio. I wish these people could read your sermon.Maybe instead of criticizing the camps for their compassionate response to an emergency situation they might have thanked them. The good thing about soil is that we can improve it. Thanks for reminding me that mine could do with some work. Ellen, I too am digging around in some of my soil.